There are a number of Discus fish diseases which can affect your aquarium, and some of these diseases can have an impact on other types of fish in the tank as well. It is important that anyone who owns these tropical fish understand all about the proper Discus fish care, to prevent stress and diseases and keep the fish healthy. One of the diseases that these fish can get is aluminum toxicity, caused by the pH level of the water being off. This can be fatal to the fish if the pH level is not maintained properly. The pH level of the tank water must be kept between a pH of 5 and 8. Any level outside these parameters can result in Discus fish diseases. The treatment for these problems is to adjust the water pH, and the fish will develop a slimy coating on their gills. Hole in the head is another disease that many fish can suffer from. This is listed as one of the Oscar fish diseases, as well as affecting Discus and other tropical fish types. Also called head and lateral line erosion, the symptoms appear as small pits or holes in the head area and along the lateral line of the fish. The cause of this disease is not fully known, and this is one of the Discus fish diseases that requires a multiple step treatment to eliminate the problem. Aquarium tropical fish with hole in the head disease will not die immediately, but it is a chronic condition. Treatment includes a thorough tank cleaning and careful water chemistry monitoring. The proper diet is also important for fish with this condition, and a hexamita treatment may be added to the tank as well to prevent any parasitic infections as well. 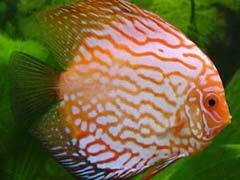 One of the Discus fish diseases that is highly infectious to the other tank inhabitants and is frequently fatal to the fish is whit spot disease, also commonly called ich. The fish will start to develop white spots which appear similar to small white blisters, and the gills will become swollen and pale in color. There are commercial medications that can be used to treat this disease if it is caught in time, but it spreads very quickly. The fish may stop eating, and may rub or scrape along the bottom of the tank, against decorations, and may appear weak. After treating the tank it is important to clean it thoroughly, including the aquarium filters, to prevent any reinfection.